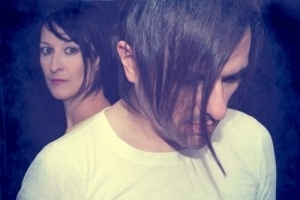 Electrogenic has managed to gain quite an audience with just their debut video and song "Game Over", but this Italian duo was just giving a little taste of what was to come when the video first came out. With clamor running about regarding their debut material, it was only a matter of time until "Double Exposure" would be released to the public. And, when it did hit, not only was it myself who praised it, but many others made positive remarks about it. Now, I'm here with an interview with both Stefan and LaCrisi discussing both the album and other subjects regarding the band's history and future. Hello and welcome to the site! Please, if you would, introduce yourselves and your band to our audience. Stefan - "Hello! I'm Stefan and I play synths and do some singing. I take care of most of the production part and the videomaking." LaCrisi - "Hi! I'm LaCrisi and mainly I'm the singer even if I play synths too. I take care of most of the lyrics." When and where did you both start playing music? Did it start with early childhood or did you pick up music later in life? Stefan - "I started playing bass when I was 14, then I started with singing around 20. Around that time I picked up my first synth. After that I started making music with my PC and during the years I focused on writing and producing songs." LaCrisi - "I started singing and playing a toy keyboard when I was 6/7. Then I grew up with music, playing guitar, and had my first small gig when I was 14; just voice and guitar. After that I never stopped to write my own lyrics and melodies using keyboard and guitar." If you could name at least one artist who has influenced your music the most, who would it be? Stefan - "If it's only one, they affected my life in so many ways that I must say Duran Duran." LaCrisi - "It is very hard to say, many artists and songs inspired me. I’ll say Depeche Mode." When and where did you guys first meet? Stefan - "I guess around 2006-2007. She surely remembers better than me, as it was around the time when she met her now husband, who is one of my oldest friends." LaCrisi - "The first time we met each other was at a barbecue party in 2007." Furthering that, what events took place leading up to the formation of Electrogenic? Stefan/LaCrisi - "We always had our own projects and kept on joking about making a band together, then one day we decided it was time to stop kidding and try to do it for real. We immediately realized we had something going on, everything came so naturally when we started the project." And when was it that you first put out material for Electrogenic? Was the response positive? Stefan - "The first thing we put out was the video for 'Game Over' and yes, we got a really positive response." LaCrisi - "Game over was the first song to be completed and we immediately decided to make a video. I think we are still getting positive feedback." When it comes to writing music, do you both always agree with mostly everything, or are there arguments in the studio? Stefan - "Usually everything works quite flawlessly, we work together on all the aspects of the songs. Sometimes one of us comes to the studio with a full song to work on, sometimes we write together, sometimes one writes the music and the other the melody….Well, you get the picture. But, of course, sometimes we have to find our compromises." LaCrisi - "We have a similar point of view concerning the various aspects of work and for this reason we agree with mostly everything." Now, I just reviewed your debut album, "Double Exposure". Tell us a little about the album. What does it contain, where can we get it, and what it's all about. Stefan - "We started working on 'Double Exposure' at the beginning of 2014. At the beginning we just wanted to try and see if and how we could work together, then everything happened so fast we decided to go full-length. We wanted an album that sounded different from the other things we had done so far, pointing more in a synthpop/electropop direction. The album is available on our Bandcamp page but also on all the major digital stores like iTunes , Google Play and so on." LaCrisi - "The album contains catchy tracks to shake the body, mixed to an emotional atmosphere which will lead you in many different stories and situations. I would like to say that 'Double Exposure' was one of the selected names of this project, but then we decided to call ourselves Electrogenic." I noticed that there's a deep blend of 80s sound with more modern, cyber-esque electronics. Is this the style that you were aiming for? Stefan - "We wanted to bring in some of our roots, but also to produce a kind of music that sounded comtemporary." LaCrisi - "This 80’s influence came naturally we never forced it." When it came to the lyrics of the album, there were some songs that seemed to be written for fun, while others seemed more passionate and emotional. Would you say this is how you wanted certain songs to feel? Stefan - "Absolutely. Sometimes we work together on lyrics and things come out in a sort of 'brainstorming' way. Other songs have lyrics that have been written only by one of us and are more emotional and personal. But I like lyrics that are not too direct, where people can find the meaning they want and recognize their own experience and feelings in them." LaCrisi - "I agree with Stefan on this one: it is very important that people recognize their own experience in our songs." When it came down to it, how did putting the album together go? Was it an easy task, or did you face struggles and hardships getting it all together? Stefan - "You always have to sacrifice something when you put together an album. An arrangement, some lyrics, parts of a song and even entire songs. But thankfully we managed to make it work without big frictions." LaCrisi - "As I said before we have a similar point of view and with just small compromises everything goes well." Aside from us, have you received any other reception from the album from either fans or other critics? Stefan - "Yes, reception is starting to come in and for the moment we are thrilled to say that they're all very positive." LaCrisi - "I was totally surprised to see how many people took a look on our debut video. Amazing!" Do you have any tours planned or even one-off gigs? And, other than that, do you have any future plans regarding Electrogenic? Stefan/LaCrisi - "We are rehearsing for the live show and already in the talk for doing some. We hope to do as many as we can. We are about to make a new video for 'Skills', and we never stop working on new material." Is there anything else that you would wish to say at this time? Stefan - "I would like to thank your audience for reading! You can find all the info as to where to buy the album on our Facebook page or on our site www.electrogenic.net." LaCrisi - "Thank you for your attention! Keep following us!" Lastly, I would like to thank you for your time, and I wish you luck! Stefan/LaCrisi - "Thank you ! We were glad to do it!"